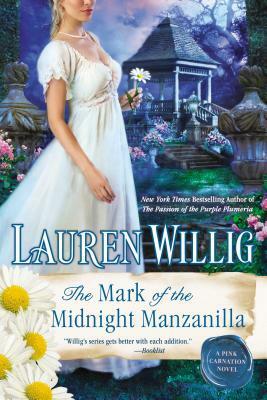 I have heard many good things about author Lauren Willig, and, in particular, the Pink Carnation series. Still, I hadn’t read any of her books yet, and this one came to me by way of a reader contest. To say the least, I was very leery of jumping into a series at book number thirteen, but it was part of my assignment, so I settled in to see what awaited me. The series of books tells the continuing story of modern day lovers, Eloise and Colin, while each book also tells another story taking place in the early 1800’s, and deals with characters who are somehow related to the Pink Carnation. a spy for England. Eloise is an American, researching the Pink Carnation, and the trail leads her to Selwick Hall in England, and to Colin. Not having read the first twelve books, and watching their love affair from the beginning, I still could ascertain that they were awkward with each other as Colin comes to visit Eloise in America. We are left to the very end of the book to find out if they are about to break up, or take their relationship in another direction. I did feel a bit lost here with their part of the book, although I certainly was rooting for them to stay together. The story of Sally and Lucien, though, taking place in 1806 London was pure delight. Lucien’s parents died when he was still a very young man, and it was said that his own mother was the one to kill his father. Lucien’s way of coping was to run away, and he spent several years in America. Now, he’s decided it’s time to come back and avenge his parents’ murders. Society doesn’t know what to make of him. Silly rumors fly that he is a vampire, and he is looked on with both fascination and horror. Soon it becomes apparent that someone doesn’t want the old history stirred up, and incidents begin to happen to try to frame Lucien for murder. Sally is a take charge, no nonsense kind of girl, who isn’t afraid to step in to any given situation. When she feels Lucien is about to be tricked into a compromising situation, she barrels in to rescue him. This leads to involving her in this whole sinister plot. They decide to pretend to be engaged, so that Sally has a reason to visit his home while they try to solve the mystery. I loved their developing relationship. They are polar opposites, yet, it works because each fills a void in the other, and they have a definite physical attraction. They also manage to tell each other some truths that hit home, causing them each to take an honest look at their own motivations. Seeing Sally in his home, makes Lucien realize how right she feels there, and he starts to think about making the engagement real. But, first they have a mystery to solve. I do like a little more spice in my romance, and this one is very tame, but so well written and entertaining that I almost didn’t miss it. Reading this book was a rollicking good time, and the pages just flew by. I will definitely be reading Lauren Willig in the future, and will start with book one of the Pink Carnation series. Recommended.